Manchester – Britain’s Second City. A contentious claim for sure, but it’s one I’m sticking with. I’m a proud (Greater) Manchester lad, so I’m allowed to be biased, however the evidence to back up this claim is undoubtedly impressive. Manchester was arguably the first city, in the North at least, to make city centre living an attractive proposition – why commute in and out of the city when you can live in a cool, new, smart apartment, close to where you work and play? Manchester has benefitted from a £1bn investment as part of the Government’s Northern Powerhouse initiative. In the main, it looks unfalteringly forward, with the City Council allowing developers to lead the way with eye catching buildings that wouldn’t look out of place in the classic skylines of New York or Shanghai. When I was a kid, Manchester City Centre was just, well, Manchester. 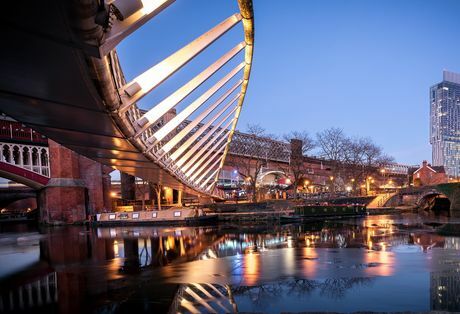 Nowadays it’s a collection of districts and villages, all with their own distinct characters, go-to venues, and places to live; but with so many investment hotspots to choose from, how do you identify the best buy to let areas in Manchester? I’ve picked out three of my favourites. I have a soft spot for Castlefield, I have to say. To get an idea, plonk yourself outside of arguably its best-known bar, Dukes 92, next to where the old cottage is and look up. THIS is what Manchester is all about – you can see all the ages and eras of Manchester from here; the old wharf buildings, once thriving, then derelict, and now housing some of the best apartments and offices in the city; the canals that transported the wares; the bridges and viaducts that carry the trains that replaced them, and towering over in the near distance, the Beetham Tower, symbolising the modernity of the new Manchester. But I digress – Castlefield was one of the first areas of Manchester to benefit from this new vision. It’s one of the few areas that isn’t seeing new development now, unless you count the area the other side of the Mancunian Way. Eat: Albert’s Shed – Dukes’ companion restaurant, surprisingly well priced too. Drink: Dukes 92 – Great in Summer, situated by the Bridgewater Canal and with a large outside terrace. Invest: One Regent – From £237,300 and with a gross rental of 6% assured for 2 years, this completed development offers great views of the city. Proud Mancunians and Salfordians alike will argue that, as Chapel Street and its surroundings are on the other side of the Irwell in Salford, then it’s not really Manchester. The reality is that it’s closer to the chic bars, restaurants and office spaces of Spinningfields than, say, New Islington, Piccadilly and the Northern Quarter is, and with its rail connections and arguably quieter road route out of the city, then this is not one to be overlooked. With the exception of City Point and Fresh Apartments, this area was largely ignored before the 2008 crash, but in the last 5 or so years, has really come alive. Invest: The Residence – From £418,000, you’ll get a net assured rental of 7% per annum for three years. Located 5-10 minute’s walk to the Arndale Centre, with the Printworks, New Cathedral Street and St Anne’s Square in the same area, this development represents a genuine City Living experience. Also in the “Not Really Manchester” category (my blog, my rules) is the jewel in Salford Quays’ crown, Media City. You’ll pay a small fortune to buy here, but this is reflected in the rents you’ll get. Media City is growing, too, on the back of the BBC, ITV and independent producers making it their home, and the fact it’s simply a nice place to be. And with demand for good quality accommodation rising, so are prices, which ought to ensure a good return on your investment. Eat: Wagamama - Somewhat smaller than your average Waga’s, but this translates into a nicer atmosphere and slicker service in my opinion. Drink: The Alchemist - The “masters in the dark arts of molecular mixology.” Proper cocktails from a menu based around the periodic table, and waterside views. Invest: Media City - From £142,500 and with a predicted 6% yield, this is the last of four towers to be built following the first three selling out quickly.